The first of two new air quality monitors in Clairton is operational this week. Located at the Clairton Education Center, the new monitor will also measure sulfur dioxide, or SO 2 , emissions, according to an update provided by the Allegheny County Department of Health. 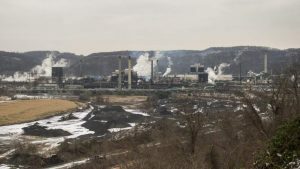 Residents have been calling for increased monitoring and oversight of emissions from the Clairton Coke Works since a Dec. 24 fire damaged equipment used to remove pollutants, including SO 2 , from coke oven gas. The health department issued an alert Jan. 9 , 2.5 weeks after the fire, advising residents — especially those with asthma, bronchitis or emphysema, as well as children and the elderly — that there could be higher than usual sulfur dioxide emissions throughout the Mon Valley. The Clairton Education Center was selected because of its location, health department spokesperson Ryan Scarpino said in an email Monday.